Extended infotainment capabilities are becoming a key selling proposition of premium cars today. Following specifications and requirements from one of the most prominent European premium car manufacturers, Telit has developed the first automotivegrade 3.5G HSDPA module in the global market space. In addition to the basic functionality of our GPRS products, the UC864-AUTO offers full EDGE and HSDPA high-speed data transmission with rates up to 7.2 Mbps enabling a completely new set of functionalities and customer experience in high-end driver information systems. Innovative features currently available only in the latest consumer smartphones become viable for the car driver enabling a whole new level of customer experience. Users can, for example, download locations from search engines into the navigation systems for routing, view satellite pictures of their destination, or stream real-time content like internet radio into the infotainment system. 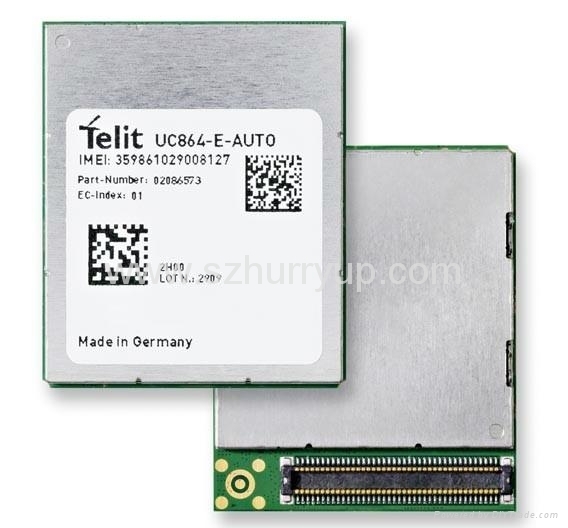 Telit's UC864-E-AUTO is a member of our connectorized GC864 form factor family meaning that fully backward compatible CDMA and GPRS solutions are available making it possible to customize applications to local market needs. In 2010, Telit will introduce a UMTS 1700 MHz (AWS) variant of this product which will offer high-speed data transmission capability for users of the T-Mobile USA network. As with all our UMTS products, the UC864-E supports Firmware update Over-the-Air or over USB 2.0 full speed interface.